In these magical snowy days, we all want to go outside and play with the snow. There are no gardens without the most important man, the Snowman. 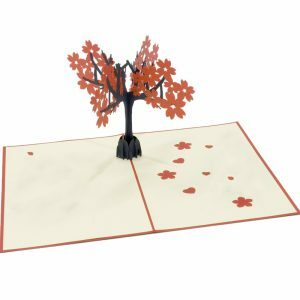 Beside the snowman made out of snow and even Snowman pop up card, there are a lot of interesting ideas of how to make Christmas paper centerpiece for your home. 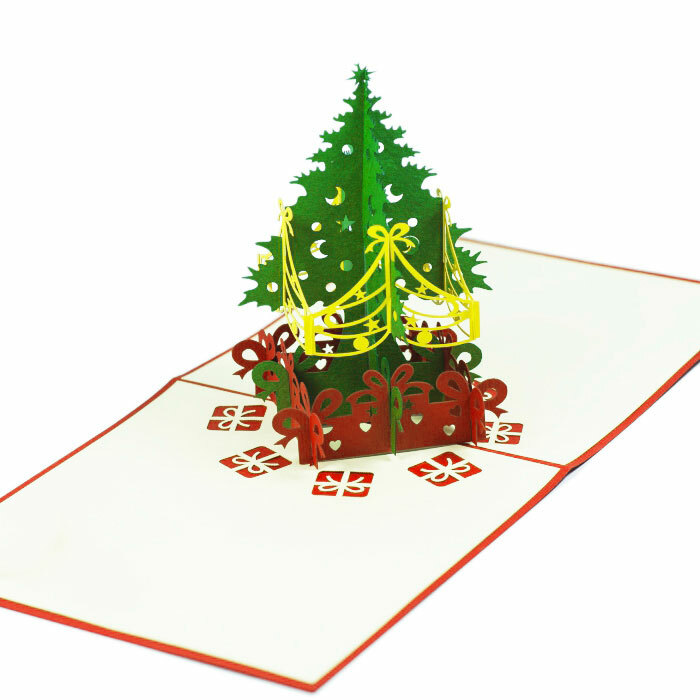 3D paper decorations, with every single subtle folded side with gingerbread necklace, gloves, and hat, will outshine every other decoration on your dinner table. Or if you want to put this lovable decoration at any corner of the house, just do it! Just brighten it with tinsel or fairy light around, and you will be embraced with a unique atmosphere that you’ve never had in previous Christmas feasts! Thus, snowman décor is one of the best selling Christmas paper centerpiece in our 2018 holiday collection. This lovely freestanding house is finished smiling snowman that seems sparkles. Around the edge of the roof are color-changing leds which look like the house has been decorated with light strings. Those have driven our kids crazy! However, what impresses adults the most is classic patterns on the outside walls of the house. It reminds us of the religious beauty that we never cease to enjoy every day. Therefore, that combo of color will help you feel warmer in the snowy Christmas! 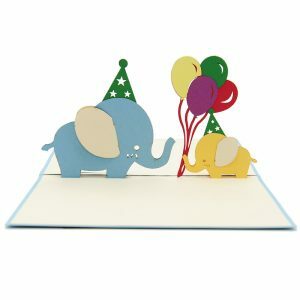 Hence, If you are bored with normal Gingerbread house pop up card, let’s try something new! 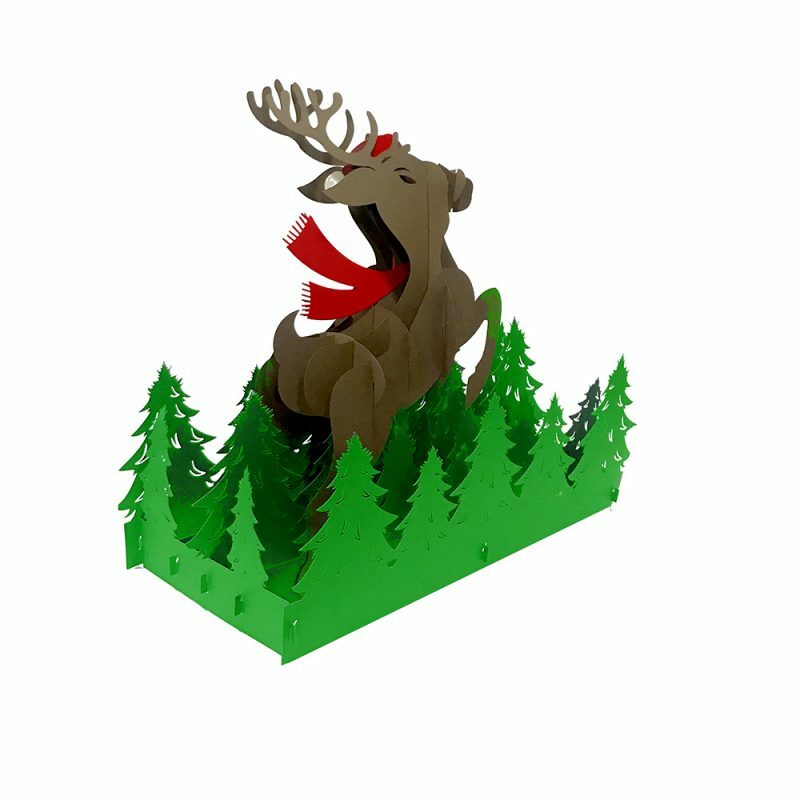 The reason I love this paper christmas decor Christmas decoration is the cozy Christmassy feeling it gives, even with normal Reindeer pop up card – that rank #1 in our top one pop up cards collection. The dark wood panelling, all the greenery and the muted color palette gives a wonderful feeling of nature and bringing the outdoors in, almost like dining in a woodland setting. I could imagine a large group of family and friends coming together and having a great time in that space and this cute brown reindeer will dance along with this atmosphere – so relaxed and wonderful! 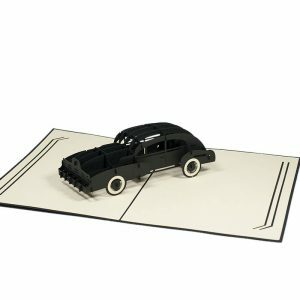 Besides, if you like, you can add some other tiny decoration such as tinker bell, tinsel or Santa sleigh pop up card and they will perform as key components to recreating this stunning yet informal look. 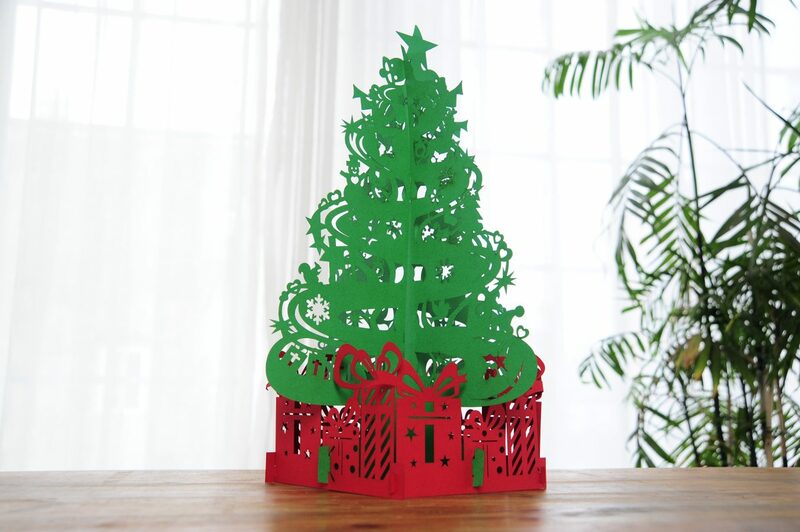 Last but not least, Christmas trees are the undisputed king of Chrismas pop up design cards. 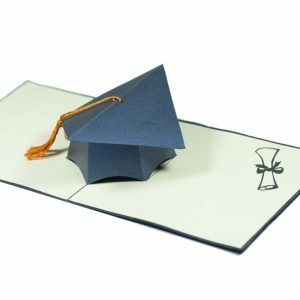 Their roots can be traced back to devout Christians in 15th century Germany, but they really took off among the general population at the end of the 19th century in Victorian Britain. While it’s not practical or aesthetically pleasing to buy a six-foot pine tree, you can make a small replica that’ll also look great on dining table or working desk or fit for a present box. With a giant bright red pot reminiscent of a Christmas gift box, a stunning green pine tree rises as though a sparkling queen putting a smile in the winter. 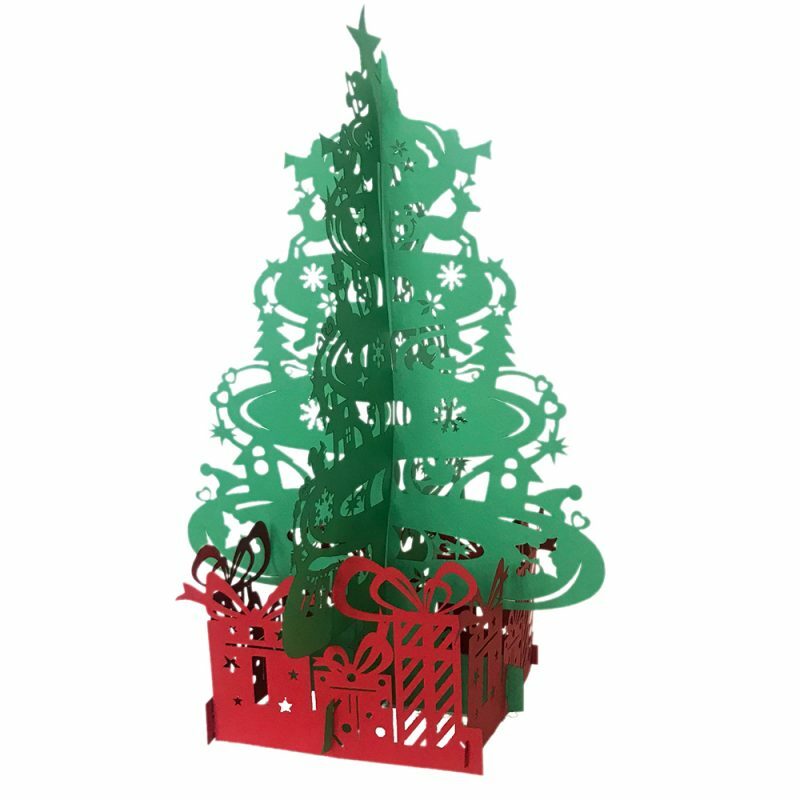 Indeed, this combination of two colors in a simple paper christmas decor will bring love and warmth to your meals, as well as boost holiday inspiration for any brilliant ideas! 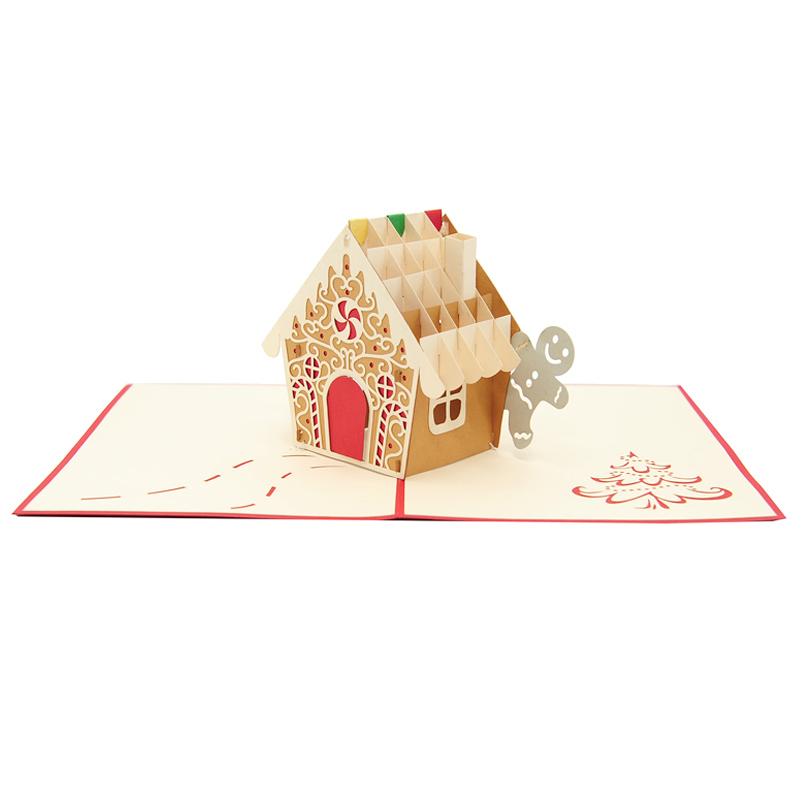 Gingerbread house pop up card has a red cover with a cool illustration of a gingerbread house. The image reveals a clue of what awaits inside. Upon opening the card and you will find a meticulously three-dimensional paper sculpture of a beautiful gingerbread house. Our craftsmen have carefully design layers and layers of the pop-up to form a perfect and lovely sculpture. Looking for gingerbread house ideas to spark your imagination? Build a child’s dream house—this little gingerbread farmhouse couldn’t be cuter. This Christmas, more than sugarplums will dance in their heads. Gingerbread house pop up card with glowing candy windows are certain to inspire sweet imaginings. 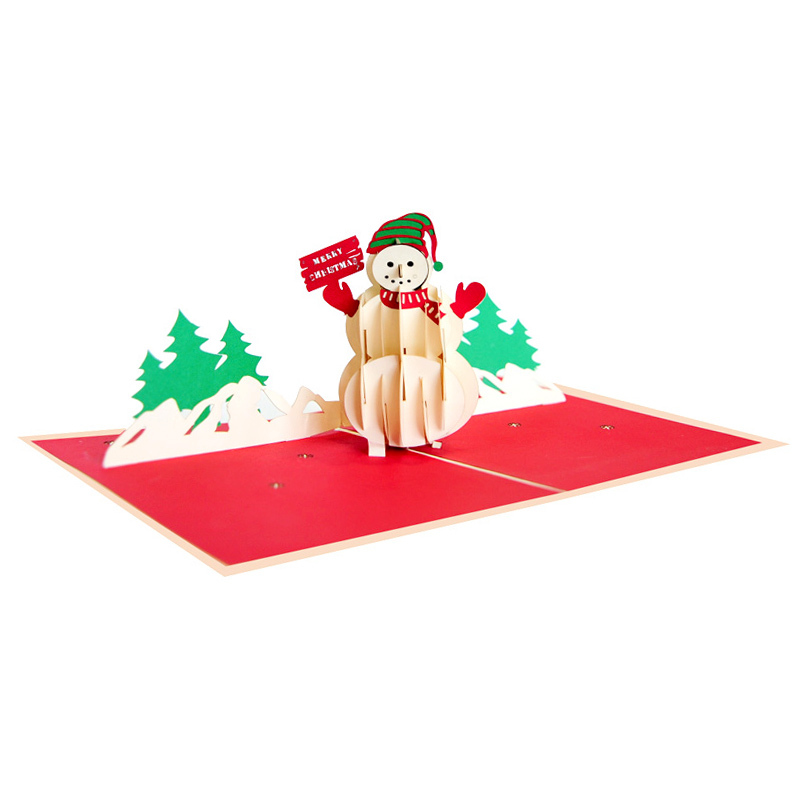 A gingerbread house pop up from a cute card is an unforgettable Christmas gift in this year. 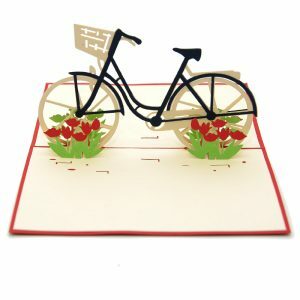 This Xmas 3d card is sure to delight your loving ones and everyone who loves a simple but creative Christmas card. 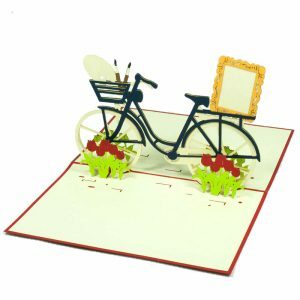 Send with some your personalized messages to your loved ones, surely they will keep them forever. Wow! What a great cards. Absolutely love them. WOW! Very nicely done! Congratulations! I received one of the most beautiful Christmas card I have ever seen. The Nativity scene! Beautiful, Amazing work. Keep it up! 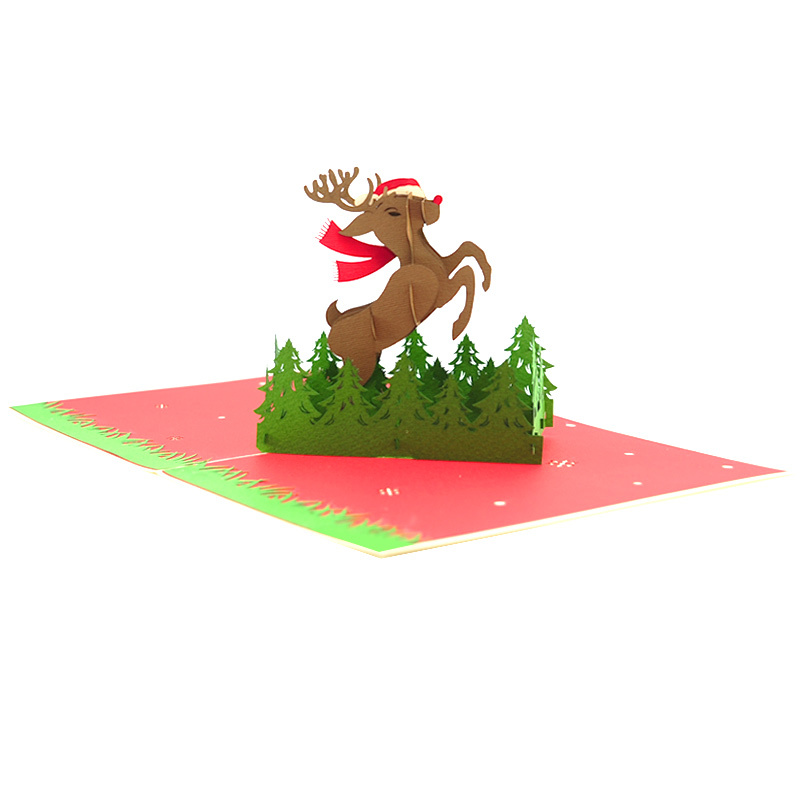 Hey Buddy!, I found this information for you: "NEW CHRISTMAS POP UP DÉCOR". 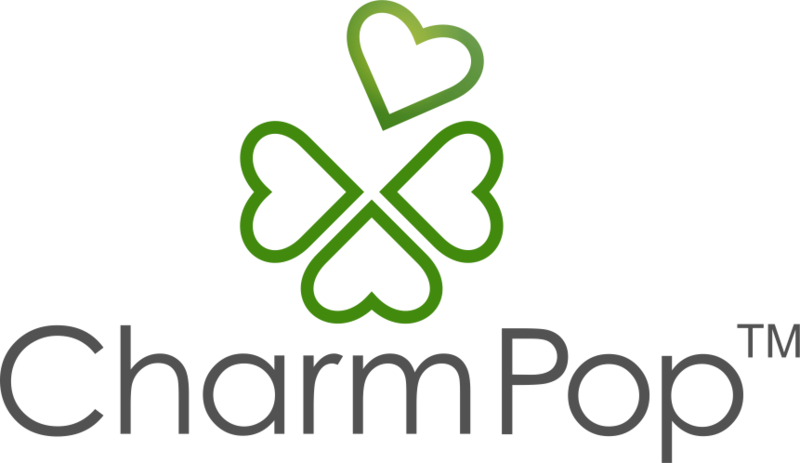 Here is the website link: https://charmpopcards.com/christmas-pop-up-decor.html. Thank you.